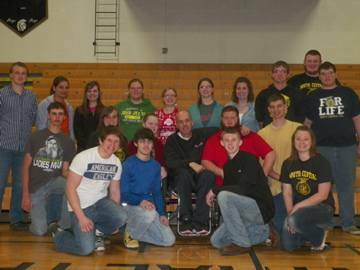 On April 12, 2013 the South Central FFA Chapter in conjunction with Farm Credit Mid-America invited Chad Hymas, motivational speaker, to speak about making good choices in life and how even the tiny acts of kindness you make in life can have a large impact. Chad was in a farm accident in his twenties and is paralyzed from the neck down and spoke to the whole entire high school about the effect of your words, anti-bullying and how one simple act can change lives. His charge to us was to be kind to everyone we meet, help one another and to get out of your comfort zone.